Norway’s boxing queen Cecilia Brækhus had to admit that she nearly met her match during her first professional fight in the US over the weekend. It was the first time Brækhus went down for the count, after a solid punch from her opponent Kali Reis, only to get back up and be declared the winner despite some booing from spectators. Brækhus praised Reis, calling her an “incredible” and “worthy” opponent. “I needed someone who can get the best out of me,” the boxer from Bergen told reporters. The match also was broadcast on HBO’s main channel, bringing more international exposure to Brækhus, who holds all major titles and is billed as “The First Lady” of boxing. Her adoptive parents were in the audience, alternatively wincing and cheering on their daughter who used to sneak out of the house to begin with kick boxing years ago. They were visibly relieved when the referee handed out points of 97-92, 96-93 and 96-93, even though there was some booing from spectators. Some felt Reis should have won, and Reis’ staff picked her up and carried her around the ring. Brækhus herself claimed she was unaffected. “I don’t care about that,” she told Norwegian media representatives who were ringside in California. 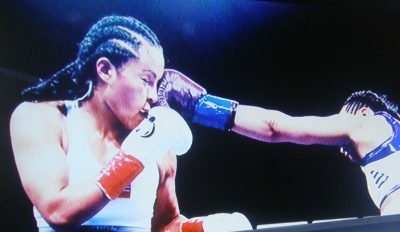 “There’s so much feedback that it was a fantastic fight.” It was also historic as the first fight between women to be broadcast on HBO, and with good reason: Brækhus, with 33 professional victories, became the first woman to win all five belts that signify championships in the World Boxing Association, the World Boxing Organization, the World Boxing Council, the World Professional Boxing Federation and the International Boxing Federation.